A complete guide and cookbook to selecting and using the best carbohydrates to lose weight, maintain blood sugar levels, and improve overall health. Not all carbs are created equal. In fact, the latest dietary research shows that different carbohydrates have varying effects on the body, depending on the rate at which they raise blood sugar levels–also known as a food’s glycemic index (GI). Choosing a balance of foods that are low on the GI will speed weight loss and control diabetes, insulin resistance, and cardiovascular disease. 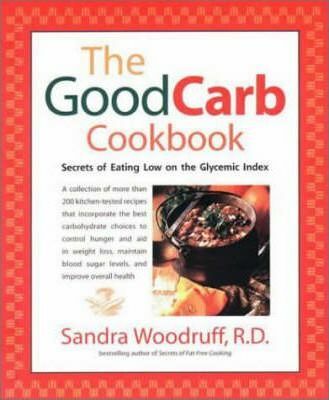 In The Good Carb Cookbook, Sandra Woodruff demystifies the carbohydrate confusion by explaining the real differences among carbohydrates (baked potatoes are high on the index, while sweet potatoes are low), and shares her secrets for eating low on the index. The book includes an invaluable table with hundreds of common foods and their glycemic index rating; more than two hundred recipes to get people cooking and eating low on the index; and tips to modify high-glycemic family favorites with low-glycemic ingredients, lose weight, maintain blood sugar, and achieve optimal health.